Luxury Yachts Whitsundays provide a spectacular selection of vessels with elegant and stylish features. Available from Abell Point Marina, Airlie Beach or Hamilton Island, our bareboat vacations or skippered private yacht charters are tailor made to your needs and your personal indulgence. Come and enjoy our gracious hospitality. The Whitsundays boasts 74 tropical islands known as Australia’s premier cruising ground. Cruising the Whitsundays guarantees incredible scenery, stunning natural landscapes and secluded beaches. Our guests enjoy experiences which make long lasting memories. The activities within the Great Barrier Reef are endless. Experience star-filled nights in tranquil secluded anchorages on board a luxury yacht, bareboat or power catamaran. Visit coral cays and deserted beaches, explore rainforests and scenic walks, or dine in splendid surroundings with burnt orange sunsets. Paddle from bay to bay, exploring inlets, caves and beaches. Come eye to eye with humpback whales. Climb the highest peak for amazing panoramic views of the Whitsunday islands or just sit and relax with a book, and indulge your senses with the sights and sounds surrounding you. Anchor at Whitehaven Beach and enjoy bathing in the azure blue waters. Take a stroll along 7 kilometres of splendid white silica sand at one of Queensland’s most favoured holiday destination. Watch in pure indulgence as the shifting champagne swirl of sands fill Hill Inlet and change before your eyes. Charter a crewed luxury yacht, bareboat power or sailing catamaran and go exploring the Whitsundays in style. Island hopping provides more Whitsunday treasures and our vessels are welcomed at all resorts in the Whitsundays. Berthing your luxury yacht couldn’t be easier at the resort marinas. Go ashore to enjoy a cocktail at the Hamilton Island Yacht Club or enjoy a round of golf at the 18 hole championship golf course on the spectacular Dent Island. The Great Barrier Reef provides a myriad of underwater adventures. Snorkel in the warm waters of the secluded bays with fringing reefs. Dive with manta rays, friendly wrasse and curious sea turtles. 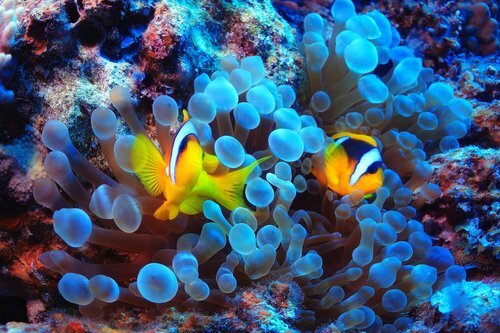 Experience the adventure of being up close with colourful reef fish amongst spectacular coral gardens. Luxury Yachts Whitsundays was established in 1981 in Airlie Beach. Our knowledge of the local region and the marine tourism industry is second to none. We invite you to explore the beautiful Whitsunday Islands with us.